ADDITIVE INSIGHTS MMS DECEMBER 2018 44 mmsonline.com Understanding Industrial 3D Printing AUTHOR | Timothy Simpson Professor of Engineering Design & Manufacturing Pennsylvania State Univeristy COMPLEX FORMS NEED STRAIGHTFORWARD SOLUTIONS: VOLLMER www.vollmer-group.com To shape the future you will need forward-looking PCD tools – and intelligent solutions for their production, processing and maintenance. 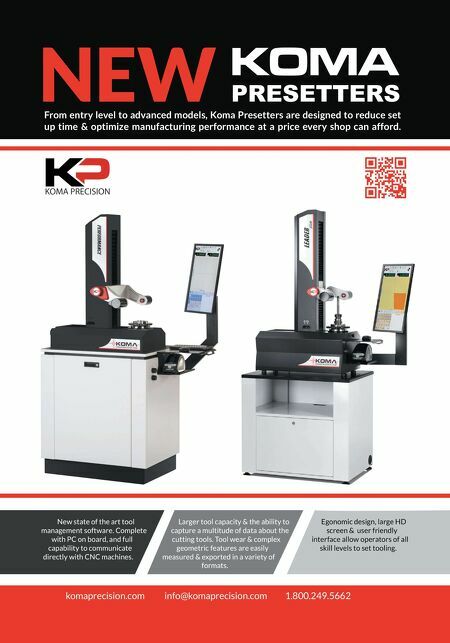 VOLLMER supports you: with innovative PCD sharpening and eroding machines, economical automation options and strong services. For the highest fl exibility, effi ciency and quality. The future takes shape: with VOLLMER. 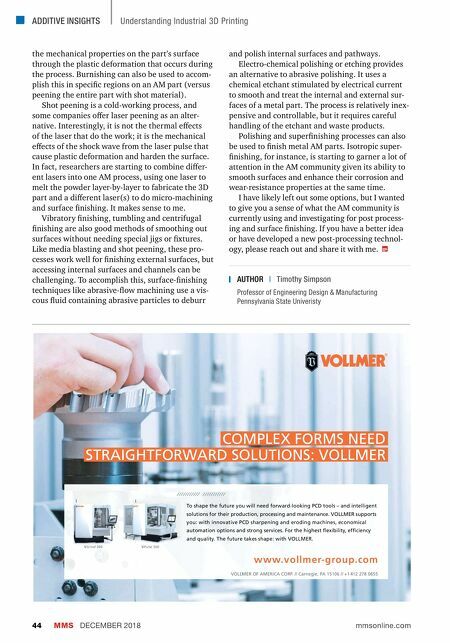 VOLLMER OF AMERICA CORP. // Carnegie, PA 15106 // +1 412 278 0655 VPulse 500 VGrind 360 V Grind 360 Grind 360 Grind the mechanical properties on the part's surface through the plastic deformation that occurs during the process. Burnishing can also be used to accom- plish this in specific regions on an AM part (versus peening the entire part with shot material). Shot peening is a cold-working process, and some companies offer laser peening as an alter- native. Interestingly, it is not the thermal effects of the laser that do the work; it is the mechanical effects of the shock wave from the laser pulse that cause plastic deformation and harden the surface. In fact, researchers are starting to combine differ- ent lasers into one AM process, using one laser to melt the powder layer-by-layer to fabricate the 3D part and a different laser(s) to do micro-machining and surface finishing. It makes sense to me. Vibratory finishing, tumbling and centrifugal finishing are also good methods of smoothing out surfaces without needing special jigs or fixtures. Like media blasting and shot peening, these pro- cesses work well for finishing external surfaces, but accessing internal surfaces and channels can be challenging. To accomplish this, surface-finishing techniques like abrasive-flow machining use a vis- cous fluid containing abrasive particles to deburr and polish internal surfaces and pathways. Electro-chemical polishing or etching provides an alternative to abrasive polishing. It uses a chemical etchant stimulated by electrical current to smooth and treat the internal and external sur- faces of a metal part. The process is relatively inex- pensive and controllable, but it requires careful handling of the etchant and waste products. Polishing and superfinishing processes can also be used to finish metal AM parts. Isotropic super- finishing, for instance, is starting to garner a lot of attention in the AM community given its ability to smooth surfaces and enhance their corrosion and wear-resistance properties at the same time. I have likely left out some options, but I wanted to give you a sense of what the AM community is currently using and investigating for post process- ing and surface finishing. If you have a better idea or have developed a new post-processing technol- ogy, please reach out and share it with me.